After the distraction of MPs expenses and the Euro-poll results where now? Two things are paramount – block the Lisbon Treaty/EU Constitution and halt the operation and consolidation of the EU Single free Market. Advantage can be taken of the situation where the new Labour Government is in some difficulties to say the least of it and a general election is now in sight and may occur sooner than next year. Four EU Member States have not ratified the Lisbon Treaty - Germany, Czech Republic, Poland and Ireland where a referendum is due in the autumn. In Britain Tory leader David Cameron has said a Tory government would hold a referendum if the Lisbon Treaty had not been ratified by Ireland. This means we must ensure the Lisbon Treaty is part of any election campaign and requires the Labour Party to be pressed to carry out its manifesto commitment to hold a referendum. The same pressure can be exerted on the Conservative Party to carry out their promise to hold a referendum. Ideally there could be two referendums held simultaneously: one in Ireland and one in Britain. This would help dissipate the feeling of isolation by the Irish electorate that they were the only country to be out of step with other States who have ratified the Treaty. The Irish No! camp has called on us to achieve side by side referendums. The EU Commission is spending one million euros (£900,000) on “information” in the period leading up to the Irish referendum. This is plain blatant interfering in the internal affairs of Ireland where the Commission has no legal role to play to get a Treaty ratified. Nobody will be in any doubt this “information” will be propaganda skewed to obtain as large a Yes! vote and reverse the substantial majority opposed to the EU Constitution last year. One outcome of the June EU summit will be a very public announcement of some Declarations which are going to be used to appease the major concerns of voters in Ireland. Declarations are tucked into the back end of a Treaty and have no legal standing. 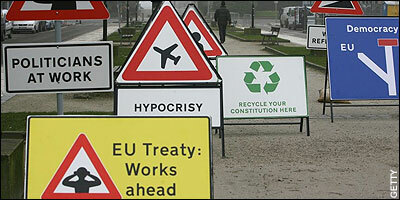 To change the Lisbon Treaty would require ratification by all 27 Member States. The Euro-federalists would not dare to take another risk of altering or amending the Treaty. One plan is to include these declarations in the accession Treaty for admitting Croatia into the EU or another Teaty. However Croatia is not happy about having controversial amendments to the accession Treaty which may not be ratified. As much noise as possible must be made to expose the fact that these Declarations have no legal value and are worthless. Put simply, their role is to obtain Yes! votes in Ireland and create confusion elsewhere. These Declarations concentrate on Ireland’s neutrality, or independence in foreign policy matters, retaining one EU Commissioner for Ireland, some human rights issues and workers rights related to jobs. However cleverly the EU wordsmiths have crafted the statement on the Declarations and the Declarations themselves will make no difference to their complete lack of legal validity. It is not a question of altruism - combating somebody else’s problems especially if they are in another country. We along with all other peoples throughout the EU will be subject to the dire implications if Ireland ratifies the Lisbon Treaty followed by the other remaining States. The importance of blocking this Treaty concerns democracy, jobs, wages and conditions arising from EU policies and the EU Constitution. All the EU institutions including the Commission and the European Court of Justice will be given more powers. More draconian measures, laws and directives will be put into place to consolidate further the free Single European Market and that will entail further attacks on the rights of trade unions which protect working people. If the Treaty is forced into place then all 27 Member States and their peoples will be locked up in the same super-state prison house. It is crunch time and the major aim is to block the Lisbon Treaty and everything must be done to achieve this objective.